Cael's character details are now listed. Page 1, very bottom. You may have run into her while she's been on a guarding job. Or her horse. Last edited by FoggyKnight; 03-02-2017 at 09:28 PM. Allepho, or usually called 'Al', has calm demeanor and aloof outer characteristic. But he is still youthful and full of temper inside. He likes a luxurious lifestyle and also rank and power. He is kind to people who treats him good but very cruel to his opponents. But there is one thing that draw him well : glory. He takes Severin dogma literally and chases glory, honor and thus power. So he would do whatever it takes to achieve the goal, in the name of light of course. 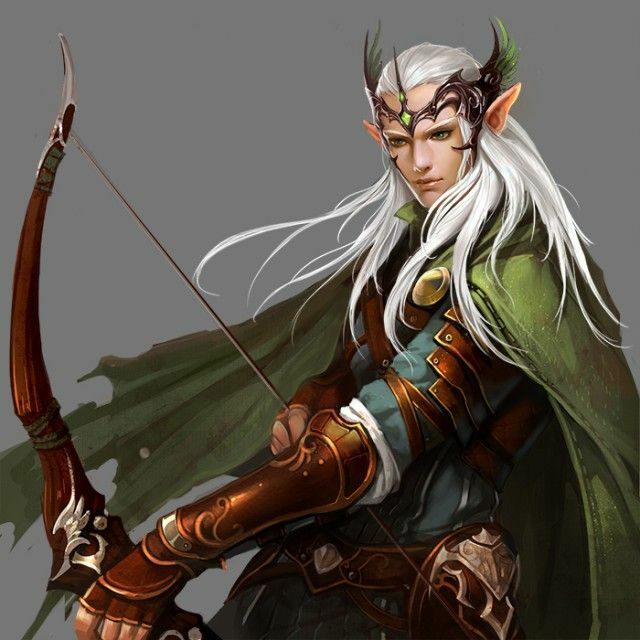 Al has silver hair and green turquoise eyes which differentiate him with other elves. His 5'5" height and lean but strong muscle also make him different from many elven that choose arcane art path. Allepho looks like Hunter Prince (functional, but elegant in the same time) and he acts like one. He carries composite longbow and rides a heavy warhorse with lance and banner attached in the lance. A little bit show off in the field, but have skill to back it up. In the ordinary life, outside of combat, Al likes to wear Noble's Outfit. He is still wearing the mock crown with jewel in the middle of it, which looks like crown. A dagger would be hidden inside, so he would never completely defenseless, although his combat prowess would on very low level. As an elf, it is not easy to come to Bel-ingran, but it was necessary to do so. For his House, he needs to make a chance, something that could bolster his House. If it means that he needs to collaborate with short-lived race, then let it be. Al was just arrived at Amaea. He has couple goals in his journey here. First of all, finding suitable ally who could cooperate mutually with his House in economical endeavor. Second is finding some lucky chances to be able to afford some trade between human organization and his House. Maybe even set up some trade routes with various merchants. Al came from Sillestriel House on smaller island at Autas Isles. Although small, the flat field on the island brought a good batch of horses. However, since the trades were limited to Aquus and Euphini, Sillestriel House couldn't grow further. Al is an ambitious person. Thus he proposes to his father, the patriarch, to make trade with larger human nation on their west, bypassing Aquus and Euphini completely, so they can get more profit and enlarge their holding. This plan contains enormous risk since it is the same with provoking other Houses in Aquus and Euphini, especially that involved in commerce and government. However, the potential pay out is equally huge. So Al silently go to Amaea to secure some contracts and feel the market before he make bigger deal. After all, for elves, a decade is nothing and they prefer to advance slowly as long as they could benefit in the end. Last edited by Xildur; 03-03-2017 at 08:10 PM. Name: The Honorable Maat von Veritas, esq. Night Justice The sound of the quill rapidly scratching paper filled the small chamber in the courthouse as the man, hunched over his desk furiously filled the page with ink. The room was lit by a small lamp burning brightly emitting a clean and efficient light. The whale oil cost more, but it was cleaner and more efficient than the crude black oil leeched from the land, and there was something Maat preferred about the clean efficiency of it. The flutter of the flame was indicative that someone was entering his chambers. Moments later the door unlatches and the small night attendant enters, I beg your pardon sir, but a Mr. Jensen is here to see you. I know it is after hours, but he was quite insistent. Sir Maat von Veritas sets the quill into its receptacle and sighs, looking at the balding elderly man who served as the night clerk at the courthouse, Very well, send him in. Hopefully it’s just a simple motion filing. Very good sir. May I present, Mr. Jensen. The old man bows and exits, as a young man in an expensive leather doublet and rich velvet surcoat enters. His coat, clasped by a large jeweled broach he has several rings on his fingers, and upon making eye contact with the judge removes his hat and bows slightly. As his eyes divert Maat takes the opportunity to inspect the man’s shoes. Cheap. A peasant’s choice in foot ware. Save your apologies and give it here, and this was a crude attempt at ex parte communication, I hope you’re aware. Taking the envelope Maat begins paging through the document, which appeared to be a motion of dismissal without prejudice…except. What the…? Do you know what you look like to me, with your velvet coat and your cheap shoes? You look like a boor. A well-scrubbed, hustling boor with a little taste and a rich benefactor. Clearly this crude attempt at a bribe wasn’t meant for me, you never would have been stupid enough to try and bribe a judge-paladin of justice, so tell me, who was this meant for. If there’s one thing I can’t abide its corruption in the ranks. The nervous Mr. Jensen locks eyes with the stern judge across the table, and like the bowels of a hanged man, everything just comes spilling out. Judges Robes Maat stood in his chambers, fixing his robes and adjusting his holy symbol. Making sure everything in place was simply a part of the job. Not a vain man, but he had enough good sense to know that appearances were important in his line of work. His ear length black hair had flecks of grey, which were further enhanced by his blue eyes and the silver shimmers in his short-cropped beard. Looking at his suit of armor and his greatsword, sometimes the judge-paladin missed his younger days when it was a simple matter of stamping out corruption with an iron fist, but these days he held a more sacred charge. His black and white robes, accected with silvered symbols of the Lady of Justice, flowed as he strode towards his seat on the bench. The Bench Maat is a sitting judge and occasional barrister, when the need arises for justice so extreme that he need argue the law before another. He has little concern for his former noble title, his material wealth, or even his reputation, what matters is law and order, justice in all things. To pursue this end he will do whatever is called of him, and often spends his spare time tending to the poor or ill and routing those who would seek to undo the justice of the land. He occasionally serves as councilor for his sister, who inherited the family lands and titles when he relinquished all claims to wear his judge-paladin mantle. His parents never forgave him, but she has come to terms with it. Of course the chateaux, serfs, and gold helped smooth things over. Noble Birth Maat von Veritas is the eldest of the von Veritas line, a noble household of significant land and power. His sister, Esmerelda, is seven years his junior, and upon his relinquishment of the titles, the sole benefactor of the family’s might. When he was sixteen, the young Maat found he had a love of justice and of the law, and as such pursued this path to becoming a barrister, but one day, he heard a voice singing in the courthouse as he scrambled by late for an exam. He paid no attention to it, but it would not be the last he’d heard of the divine song. The next day he heard the song again, and could not help but see who was singing in a courthouse. Traveling through the halls, following the sound that no one else seemed to notice, he ended in a grand rotunda, empty of people, the music echoing through the chamber. There in the center of the room, was a marble statue of Thaia, Lady of the Law, the dispenser of judgements. Her song was so pure, so clear it brought the young lawyer to tears. He joined the ranks of her clergy that very night, rising to the rank of justice-paladin, a coveted and respected honor, few were capable of holding. Armed with sword, quill, and gavel, Maat stamps out chaos and corruption with aggressive prejudice. My word is the law as my blade is the punishment. Last edited by wodine; 03-05-2017 at 02:23 AM. We are currently working on revamping the racial demographic. I will let you know when that info comes available to the public. Probably in the next couple of days. It will be some interesting stuff, but there will be limitations. For example, I think someone asked for a Kitsune, and we won't be having races like that available as PCs. Not to say that they don't exist at all in this world, just not in any capacity that would make them accessible to the general population. Well, hum. Consider me intrigued. Last edited by Insacrum; 03-06-2017 at 03:46 PM. Xildur - [imgr] is your friend. We've had plenty of stuff that we've been building on for the past six years but this Book is bringing a lot of new things to the forefront. Lot of questions to answer and we are trying to take care with each one. It is unique I think that we are in such close contact with each other during this particular application process that we get to address these kinds of questions. That does mean that it can take some time to finally get the answers out. We will have a big unveiling of race information probably tomorrow for example.. Been crunching on that for a few days, but it looks good so far, I think people will respond well to it. Same with Religion and Factions, these things have only just come to the forefront and we are trying to take it as it comes and address things appropriately. Thank you for your patience. I see some new applications, but I took the night off and went to see Logan and I am glad I did, you should see it. Best one yet. Now I am going to pick back up with worldbuilding with my coDM. Today was a good day. Rock on Gath. I look forward to collaboration. I plan to present material to you soon. I fleshed out my secret text a bit, but I'm sure I'll update it more once the race info comes out. Awesome, glad to see the race chart up. Any word yet on my query regarding sorcerer bloodlines, or is that next in the line of things to look over? Working on Religion today. Might take a break and check out sorcerer bloodlines. Since innate magic is such taboo it has taken a back seat mostly. So, curious. Are spontaneous Magic users in your world just...not a thing mostly? Bard, Bloodrager, Skald, Sorcerer and Summoners in the Arcane field are just not a thing that happens much? Last edited by Gath; 03-03-2017 at 09:31 PM.